From drone racing to aerial photography, remote control (RC) flying is one of the fastest growing hobbies in the United States. According to The Flight Safety Foundation, one million drones (878,000 operated by hobbyists and 122,000 used for commercial and government use) have been registered with the U.S. Federal Aviation Administration (FAA). If you are one of the lucky people that owns a drone and if you want to get the most out of your flights, it is very important you consider a few important points as you start flying. Drones must be flown under 400 feet above ground level. near critical infrastructure like power plants, dams, etc. The FAA has created a free mobile app called B4UFLY that uses your device’s location to inform you about airspace and flight limit restrictions. B4UFLY is admittedly not a very well-designed app, but it does provide you with the critical airspace information you need before your flights. B4UFly is available for iOS or Android. A Visual Observer (VO) is a member of a flight mission that serves as a second set of eyes to monitor your drone in flight. The main reason to use a VO is for greater situational awareness during a flight. While you are focusing on your drone’s controller and camera, your VO can maintain line of sight with the drone to help ensure that you are flying safely. Although a VO is not required by the FAA for regular drone missions, having one is certainly useful, and can help mitigate risks during a flight. When you fly with a VO, the FAA considers you the Remote Pilot in Command (PIC). For more information on the roles of the Visual Observer and the Remote Pilot in Command, see the Section 2 of the FAA’s Operation and Certification of Small Unmanned Aircraft Systems. For a complete list of requirements and testing information, see the Becoming a Drone Pilot section of the FAA website. Homeowners or renters insurance is probably sufficient for most recreational drone flyers, but if you plan to fly your drone commercially, you may want to consider additional liability coverage. Several companies now offer drone insurance policies that go above and beyond what is in your home or renters policy, including medical and accidental death coverage, as well as additional liability coverage. Leading drone manufacturers like DJI and Yuneec offer optional equipment insurance beyond the standard purchase warranty. DJI’s drone protection plan called DJI Care Refresh is valid for 12 months and offers up to two full replacements if accidental damage occurs to your drone during normal use. Yuneec offers a similar warranty program called Yes! Extended Service that covers up to two non-warranty repairs. See the manufacturer links above for protection plan terms, conditions, and warranty exclusions. Flying groups and meetups are great ways to network and learn from the expertise of other flyers. Flying groups are generally organized around either drone racing, stunt flying, or aerial photography. Pick a meetup group (or groups) that align with your interests and enjoy learning from fellow enthusiasts. 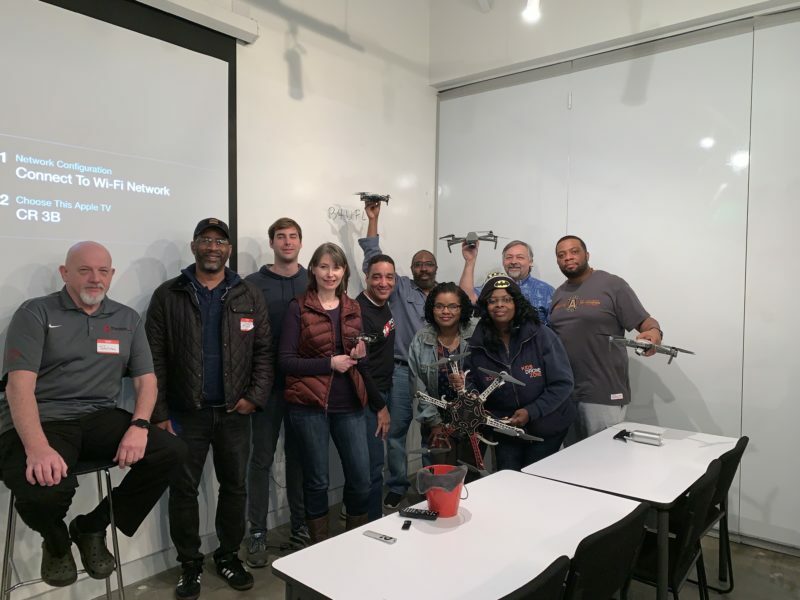 If you are an Aerial Photographer in the Atlanta area, consider joining our Atlanta Aerial Photography and Drone Fly Meetup group that meets once a month. More information about our group can be found at atlantadronegroup.com. Please note: All laws and regulations cited here are as of the time of this writing. Please refer to the links in this article for the latest drone laws and flying regulations. If you have specific drone questions that you need help with, please refer to the Unmanned Aircraft Systems section of the FAA’s website, or get in touch with me through the Contacts and Bookings page on this site. I have been a Part 107 pilot since 2017, and I am more than happy to answer any questions I can for you. Happy flying!